District 12 opponents, the Hornets draw the first line in the sand. Elizabeth Durnall gets the game winner midway through the second half via a PK. Hornets first win of the season. The Bulldogs, after losing in PK’s to Carthage in their 1st ever game, run up against the powerhouse Irish. The Bulldogs open their season at home and run into a juggernaut. 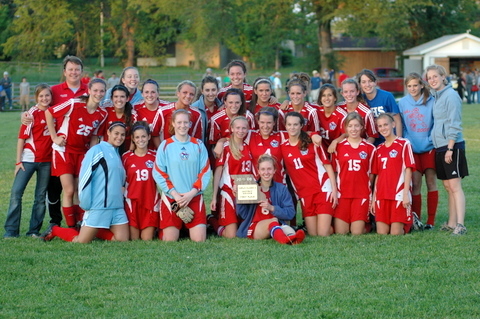 Nixa goals by Hannah Barber, Kelsey Haist (2), Jo Pavlowsky, Rachel Murphy (2), Kelsey Bartell, and Alli Schleismann. Kelsey Bartell and Jo Pavlowsky had 2 assists each with Ashlyn Robillard tallying one. Central’s goal was scored by Marika Starks and assisted by Mariah Hicks. The Pirates get their first taste of an established regional team and the game ends early as a result. The Waynesville Daily Guide offers this: A pair of freshman–Sarah Dowling and Jesslyn Clark–combined for half of the goals in the contest. Dowling had a hat trick with three goals and Clark scored two. Senior Erica Combs also scored three goals, also recording five assists. The Liberators open their season at Ozark in windy and speedy conditions on the Tigers artificial surface. After keeping it close in the 1st half with the win, tying 1-1 on Jonna Welch’s first goal of the season, the Liberators gave up 3 in the 2nd half to fall to the home team. Sophomore Mollie Killion got the game-winner in the 52nd minute of play while junior forward Alicia Collard and junior Megan Jenisch completed the scoring.